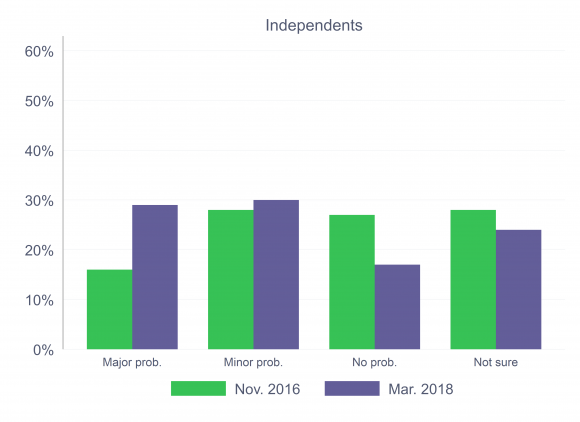 A recent survey of 2,000 adults shows that Americans have become more concerned about election hacking than they were in 2016, and that a partisan divide has widened over these concerns. In this post, I look at the issue of hacking. The story starts in November 2016, when I threw two questions onto the end of the Survey of the Performance of American Elections. These questions asked respondents to report how much of a problem they though computer hacking was in the administration of elections in 2016, both nationwide and locally. Recall that news and rumors of hacking — of social media, campaign websites, voting machines, and voter registration files — were a part of the news diet at the time, but it hadn’t developed into the major, multi-pronged story that it is now. Back in November 2016, 17% of respondents thought computer hacking in elections was a major problem nationwide, while 10% thought it was a major problem locally. What a difference a year makes. Last week, when I asked identical questions again, the percentage of Americans believing computer hacking in 2016 was a major problem had doubled — to 38% who believed it was a major problem nationwide, 20% locally. Table 1. Question: How much of a problem do you believe computer hacking was [nationwide/locally] in the administration of elections in 2016? What’s especially noteworthy about this change is the partisan detail. 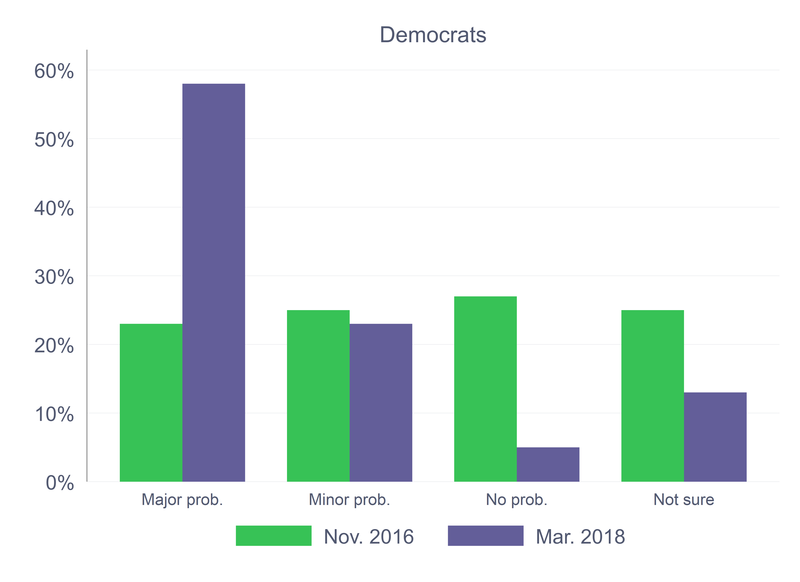 Although respondents in all three major partisan categories (Democrats, Republicans, and Independents) were more likely to view computer hacking in 2016 as a major problem, the biggest shift came among Democrats, who went from 23% viewing hacking as a major nationwide problem when asked about it in November 2016, to 56% when asked the same question this month. (See the accompanying figures; click on any of the figures to enlarge them.) The fraction of Independents viewing hacking in the 2016 election as a major nationwide problem grew from 16% to 30%; the fraction among Republicans grew from 10% to 18%. Similar partisan patterns appear when we look at the question of computer hacking as a local election administration problem. Among Democrats, the percentage saying that computer hacking was a major local problem in the 2016 election was 14% in November 2016, compared to 29% when the same question was asked this month. Among Republicans, the percentage had grown from 4% to 9%; among Independents, it had grown from 10% to 17%. Leaving aside partisanship, there is greater concern with hacking as a nationwide problem than as a local problem. This may mean greater pressure on state and national officials to address problems of election cybersecurity than on local officials. Of course, as anyone in the elections business knows, the decentralized nature of election administration in America means there are lots of small jurisdictions that are probably the most vulnerable to attacks. Whether political pressure will line up with the nature of the threat is a question that is raised by these results. 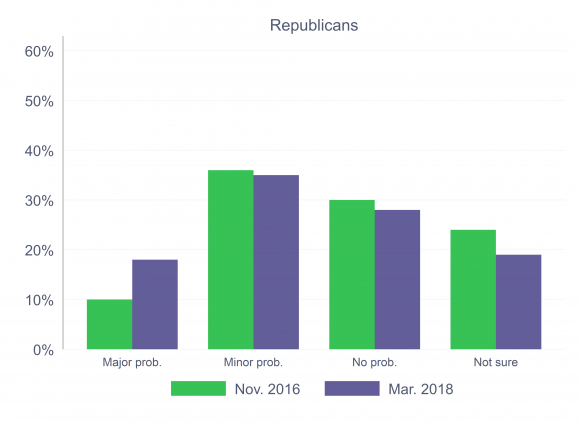 Adding partisanship to the mix, and there is a significant mismatch between the Democratic and Republican mass publics about the severity of the problem. To the degree that election security reaches the political branches, this means that Democrats are likely to feel more pressure by their strongest supporters to do something about security threats, such as pass legislation like the bipartisan Secure Elections Act, than Republicans. Luckily, state and local election administrators don’t need partisan pressure to be attentive to issues of security, but the partisan perception of the threat may make it hard for them to get much help legislators on the issue, depending on local circumstances. That’s enough on the partisanship angle for now. The survey contained a couple of other questions about perceptions of the threat of computer hacking in elections, which I hope to write about in the coming days. Methodological note. The March 2018 survey referenced in this post was conducted by YouGov as a part of their omnibus survey. The November 2016 Survey of the Performance of American Elections was also conducted by YouGov as a special project. Both surveys were weighted to produce a representative sample of American adults. The questions about computer hacking asked in each survey were identical. This entry was posted in Uncategorized on March 7, 2018 by cstewart.